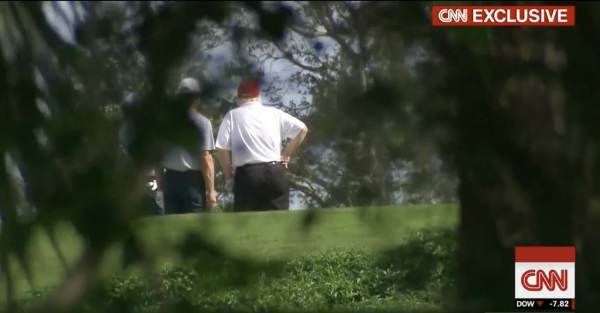 CNN creepily filmed President Trump golfing at Trump International Golf Club in West Palm Beach, Florida on Tuesday. In the top right corner of the video, the news network proudly displayed “CNN EXCLUSIVE,” in red and white. “The president golfed with Georgia Sen. David Perdue (R), PGA tour player Bryson DeChambeau and former pro golfer Dana Quigley earlier today at the course, according to the White House,” says The Hill. Prior to hitting the links for a well deserved break from the Swamp, President Trump blasted the FBI over a “Fox and Friends,” report suggesting the bureau used the unverified Fusion GPS dossier to spy on transition officials. “WOW, @foxandfrlends “Dossier is bogus. Clinton Campaign, DNC funded Dossier. FBI CANNOT (after all of this time) VERIFY CLAIMS IN DOSSIER OF RUSSIA/TRUMP COLLUSION. FBI TAINTED.” And they used this Crooked Hillary pile of garbage as the basis for going after the Trump Campaign!”, tweeted President Trump Tuesday.